I’ve always wanted to make a top 10 list. The problem is, there aren’t really any steadfast rules to being an organized person. We are human beings. We are individuals. We think differently, act differently, and perceive things differently. This is determined by genetics, our environment, and even our culture, just to name a few. That said, I will make a few suggestions- and if they ring true- then apply them. If not, read on to the next. First, strive for balance, not perfection. 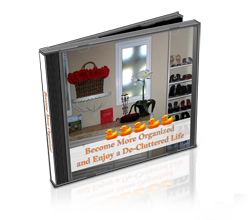 I’ve found that if perfection is your standard when it comes to organizing, that you’ll do just that. Organize. Organize constantly. This is not a balance approach, and tend to be time consuming. Second, be realistic. Do tasks in bite sized pieces if that’s all you have time for. Do what you can do. Be happy with that. Move on. Third, start as you mean to go on. When implementing a system, visualize the end. Then begin with that intention in mind. Fourth, stick to it. Once you’ve developed a ‘system’- even if it’s going through the mail immediately and tossing what you don’t need, then continue with it. Fifth, maintain your environment. Organizing is like cleaning. We clean our homes when they are dirty, we organize when things become chaotic. Sixth, know yourself. If you are a ‘do it all at once’ kind of person, then by all means, take a weekend and bust it out. If you are a ‘do a tiny task’ a couple of times a week type, that’s fine too. Seventh, be honest. Disorganization leads to chaos. Chaos leads to loss of time, confusion, lost items, forgotten plans. I know you know exactly where that piece of paper is on that pile on your desk- but I guarantee you will find it faster if it’s in the same spot each time. Eighth, everything must have a home. That means when you, or someone in your family or business uses something, it goes back to that exact spot when you are finished with it. It lives there. Ninth, Organization does not come naturally, as I have previously written. It does not come naturally by reading all the books on organization or buying all of the newest gadgets to get organized. It is a learned behavior for many. It is a habit. This is what we will be working on this year. Last, do only the next indicated step. This means that when approaching a task, don’t look at the entire room, office or home if it is upsetting, but only the immediate item in front of you. This will immensely aid in decreasing feelings of being overwhelmed, as well as for those of you who tend to get a little distracted. Wow- I guess I did finally do my list of 10- at least for today. Like everything, things change. So will you if you stay tuned! Love the advice Missy. I made a plan for the month of January to take a 1/2 hour a day and organize or de-clutter something small. Hope it will add up to some big changes!